Need a point-of-purchase display for a new product, but aren’t sure where to start? Have a unique set of requirements for your merchandising display that can’t be fulfilled by in-stock display options? At Vulcan Industries, our creative team works with you to design custom store fixtures that meet your business’ needs. And with more than 70 years of experience as a display manufacturer, we have the knowledge set and tools to make your ideas come to life. Discover all our capabilities, and learn what Vulcan Industries can do for you in a recent interview with Director of Creative Strategies, Chuck Lee. Q: Creatively, what can Vulcan Industries do for its clients? A: “One thing we can do in design is solve problems. Whether you need a display that holds more products, want an easier setup or takedown, desire a mobile fixture, or one that incorporates electricity, Vulcan Industries can solve that problem for you. Q: How does the creative process work at Vulcan Industries? A: “We begin by listening to your issues and the challenges you’re trying to overcome. We seek to fully understand your needs. Based on this conversation, our creative team begins brainstorming ideas with you. 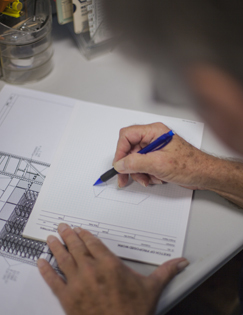 And with your input, we develop multiple concepts that start as sketches and develop into CAD renderings. If our creative team has questions pertaining to functionality, we meet with engineering to help with conceptualization. Q: How are the creative solutions Vulcan Industries offers superior to competitors’? A: “At Vulcan Industries, we do things differently. Many display companies will try to solve your problem with their stock line of products—a solution that saves them time and money. Vulcan Industries is different because we don’t sell you on a stock line of products. We can better solve your problem because unlike other companies, we aren’t married to solving your problem with in-stock options. Want to get started on your new point-of-purchase display? Contact us or request more information today!